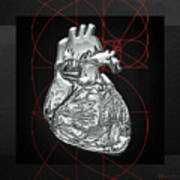 There are no comments for Silver Human Heart On Black Canvas. Click here to post the first comment. 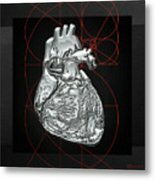 Introducing the �Inner Workings� collection by Serge Averbukh, showcasing convergent media paintings of human anatomy. Here you will find framed and wrapped/stretched canvas fine art prints, featuring Silver Human Heart on Black Canvas. 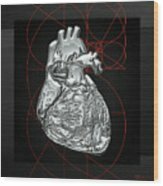 The human heart is an organ that provides a continuous blood circulation through the cardiac cycle and is a vital organ in the human body. 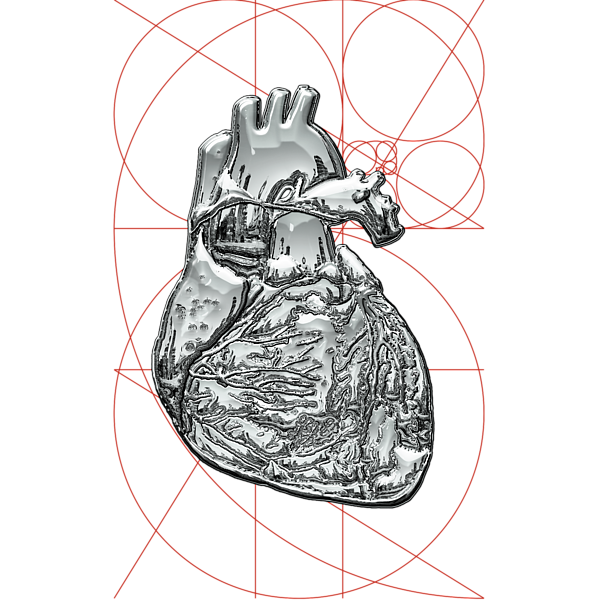 The heart is divided into four main chambers: the two upper chambers are called the left atrium and the right atrium (plural atria) and the two lower chambers are called the right and the left ventricle. There is a thick wall of muscle separating the right side and the left side of the heart called the septum. Normally with each heartbeat, the right ventricle pumps the same amount of blood into the lungs that the left ventricle pumps out into the body. Physicians commonly refer to the right atrium and right ventricle together as the right heart and to the left atrium and left ventricle as the left heart.